When you start your first business, most of us still think like an employee. We create a job for ourselves, but not really a business. 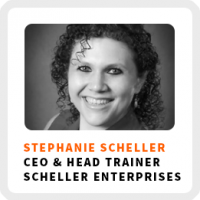 Stephanie Scheller helps explain the difference between being a business owner versus business operator. She’s the CEO and head sales trainer at Scheller Enterprises. She built her current business with her mom. She’s also an author, a 2nd-degree black-belt, speaker and podcaster. Check out her show Black Belt Selling on iTunes. Why it’s so important to understand every facet of your business. How personal development helped improve her sales skills. How to get comfortable asking for help. Recognize your trigger points that cause you to spin out of control. Why you should focus on sales more. Ideal work environment: Curled up on her couch, in her cozy front room, with a giant drafting desk and massive pieces of paper, barefoot with a glass of wine. 90-day goal: Get the new business off the ground. 1) Busy work like emails, sending invoices, and calendar management. 2) Don’t look to outsource things like sales at first since you will almost always be more passionate about your business.